Coptic Soldier & Miriam Waks – The Sound of Wings is an eight track release that comes with a 6 track bonus disc (the 4th CD in the I Forget, Sorry! series). What you can expect from this album is a lighter side of hip hop beats and some topic choice per track, there’s some really nice beats in here backed by real instruments and some good lyrics too. 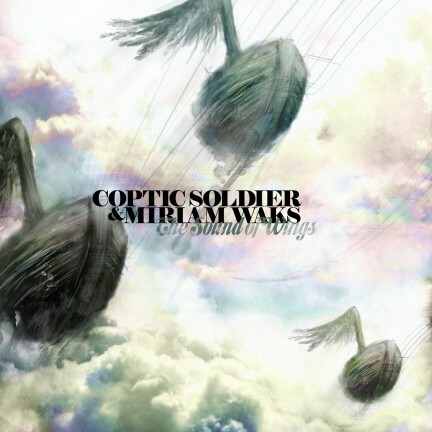 If you want to check it out you can grab Coptic Soldier & Miriam Waks - The Sound of Wings now on iTunes, otherwise check out Coptic Soldier’s website. This is Coptic Soldier‘s debut release after releasing two mixtapes over the past 3 years (False Start Mixtape in 2007 and The Past 3 Years Diary in 2009). Since False Start there has been serious growth in his work, however he’s still growing and there’s still something lacking in Coptic’s work in parts of this release. The takes on tracks like Why Suffer & “The Last Track” (which i dare not name, as I just can’t believe it’s on the disc) present a forced flow that many have come to expect from Coptic Soldier on past releases. While tracks like Sherbrook feat. Mind Over Matter, No More Waiting feat. Phatchance and Liquid Company show the growth in Coptic Soldier‘s presentation that I was talking about earlier. A much more pronounced, defined, smooth and consistent flow that doesn’t feel forced or stiff. All i’ve done is talk about Coptic Soldier and how he’s developed as an MC, but one thing i’ve skipped is Miriam Waks. Quite simply put, without Miriam Waks this CD just wouldn’t be the same. Miriam Waks features on pretty much every track in some way shape or form and gets a solo in Skin Deep. Skin Deep is not exactly a hip hop track, but that’s ok because it’s a great break up song and most of the album is borderline hip hop. Lyrically you could say it’s quite generic, but as a whole it’s quite possibly one of the best songs on the album; Why it isn’t all over radio airplay i don’t know. Miriam Waks adds more to this release than you’d expect. By about the third listen i decided to try imagine what it’d be like without all those little vocal cuts and nice singing between the raps, attempting to just block them out; the cd just wouldn’t be the same. Sherbrook is my favourite track track off the album, featuring up and coming sydney siders Mind Over Matter. It’s just a really nice beat, backed up by clean raps; i’m not sure exactly what the theme is here though. Smiles Again & Willow from Mind Over Matter just smash out some nice raps. Mind Over Matter have been coming up slowly for quite a while now and I promise you now these guys are going to be something. Presentation wise, this is a pretty slick package. I’ve come to expect this kind of stuff from the I Forget, Sorry! crew and it doesn’t feel so nice anymore. Quite simply put it’s a digipak imitator, cardboard printed, folded down and stuck together to produce CD packaging. The booklet has been stuck to the front of the inside, a minor annoyance that means you can’t just read the booklet without lugging the packaging with it. Then the CD is just stuck on the center panel with a black foam dot, the IFS #4 bonus disc slotted fairly carelessly in the right packaging fold. The artwork is tight from front to back on this release is just awesome. The picture you can see above from the CD cover is carried through every aspect of the packaging; with the CD booklet set on clouds. I guess the packaging is presented well it’s just the few minor things mentioned above that let it down. All up this is a nice release, if you wanna check it out you can grab Coptic Soldier & Miriam Waks - The Sound of Wings now on iTunes. I wouldn’t go recommend it to staunch hip hop heads, but plenty of people are really going to enjoy some of this CD, just not Phil Collins. Oh, why do rappers always try and sing?